Patrick Duffy is an excellent spokesperson due to his experience as an actor. Well known for his work and expertise, he is an ideal spokesperson full of credibility and professionalism. Below is an interview he recorded with the BBC about gambling. If you're interested in a TV personality spokesperson for any radio or TV interviews please get in contact with us. Patrick Duffy (born March 17, 1949) is an American actor, best known for his role on the CBS primetime soap opera Dallas, where he played Bobby Ewing from 1978 to 1985 and from 1986 to 1991. Duffy returned to reprise his role as Bobby in a continuation of Dallas, which aired on TNT from 2012 to 2014. He is also well known for his role on the ABC sitcom Step by Step as Frank Lambert, from 1991 to 1998, and for his role as Stephen Logan on the CBS daytime soap opera The Bold and the Beautiful (2006-2011). Duffy plays the lead character's father in the 2014 NBC sitcom Welcome to Sweden. In 1976, Duffy landed the role of Mark Harris in the short-lived television series Man from Atlantis. Following the series' cancellation in early 1978, he got his big break in the role of Bobby Ewing on the soap opera Dallas. The show became a worldwide success. Despite its success, Duffy opted to leave the series in 1985 with his character being killed off onscreen. However, with both the show and his career on the decline, he returned in 1986 in the infamous shower scene that rendered the entire 1985–1986 season "just a dream." Duffy then remained with the series until its cancellation in 1991. He also appeared in several episodes of the spin-off series Knots Landing between 1979–82. Throughout the 13-year run of Dallas, Duffy directed several episodes of the series. Along with Dallas fame, Duffy has also tried his hand at singing, and in 1983, he had a hit in Europe with "Together We're Strong", a duet with French female singer Mireille Mathieu. The single reached #5 in the Netherlands in April 1983. Duffy with Linda Gray at the 2013 Monte-Carlo Television Festival. At the end of Dallas' run in 1991, Duffy began another television role, as Frank Lambert on the family sitcom, Step by Step in which he co-starred with Suzanne Somers. The series ran until 1998, and Duffy also directed numerous episodes. Also in the 1990s, he appeared in two Dallas reunion television movies; J.R. Returns (1996) and War of the Ewings (1998), both of which he also co-produced. 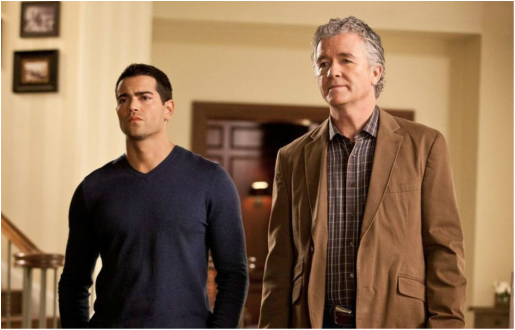 He has reunited on several occasions with many of his Dallas co-stars both onscreen and off, most notably for the non-fiction television special Dallas Reunion: Return to Southfork in 2004. Duffy later continued to act in the occasional guest or voice acting appearance, including the series Family Guy (in which he appeared in a live action scene with Victoria Principal as they spoofed the Dallas shower scene), as well as Justice League and Touched by an Angel. Duffy starred in the television movies Falling in Love With the Girl Next Door and Desolation Canyon. In 2006, he began a recurring role on the daytime soap opera The Bold and the Beautiful as Stephen Logan. From April to July 2008, he hosted Bingo America, a partially interactive game show on GSN. Duffy reprised his role as Bobby Ewing in TNT's remake of Dallas.The series aired from 2012 to 2014.